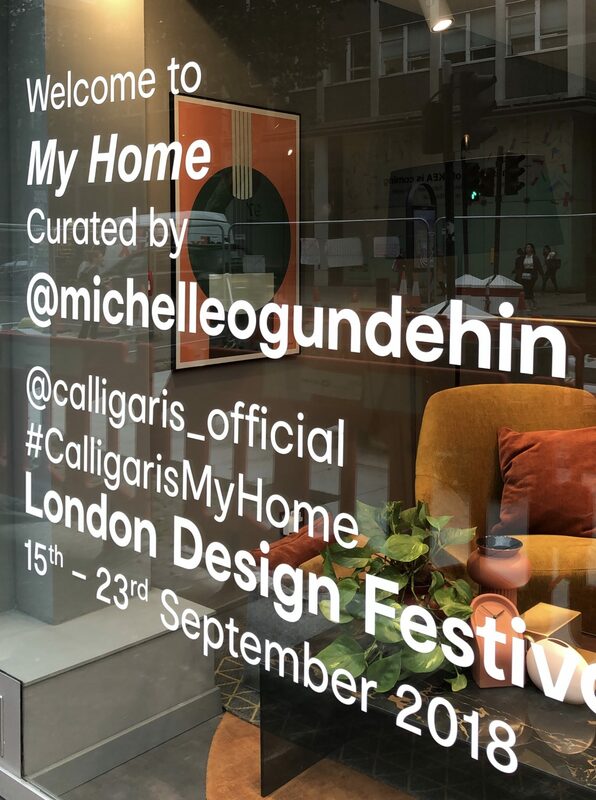 In celebration of the launch of its new collection during the London Design Festival 2018, I was asked to curate and restyle the new Calligaris showroom on London’s Tottenham Court Road. The project involved an edit of the available pieces, and the complete recolouring and decoration of the space itself. Window decal at the new Calligaris showroom on London’s Tottenham Court Road. 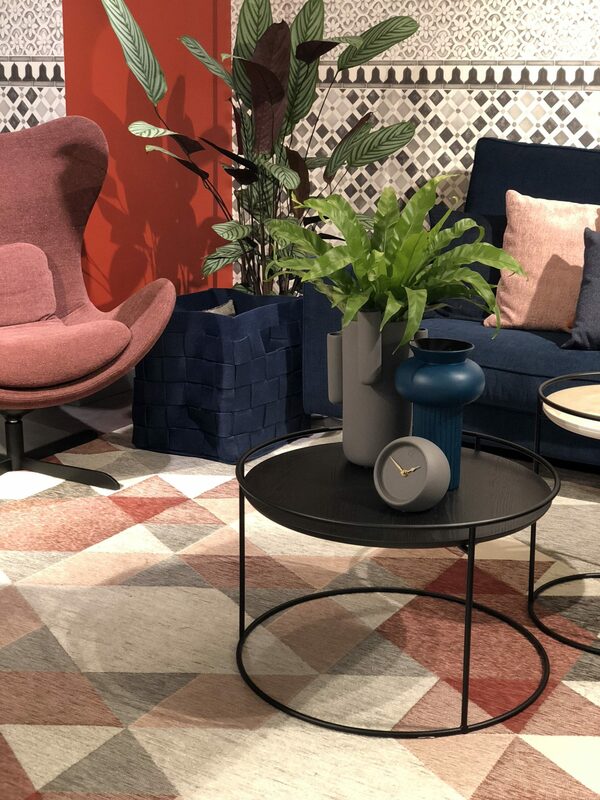 I was inspired primarily by the colours — rich greens, terracotta, gold and pale pinks — of the Calligaris CODE collection, a range of brilliant new accessories including pots, platters, candleholders and clocks newly introduced to the collection by the brand. 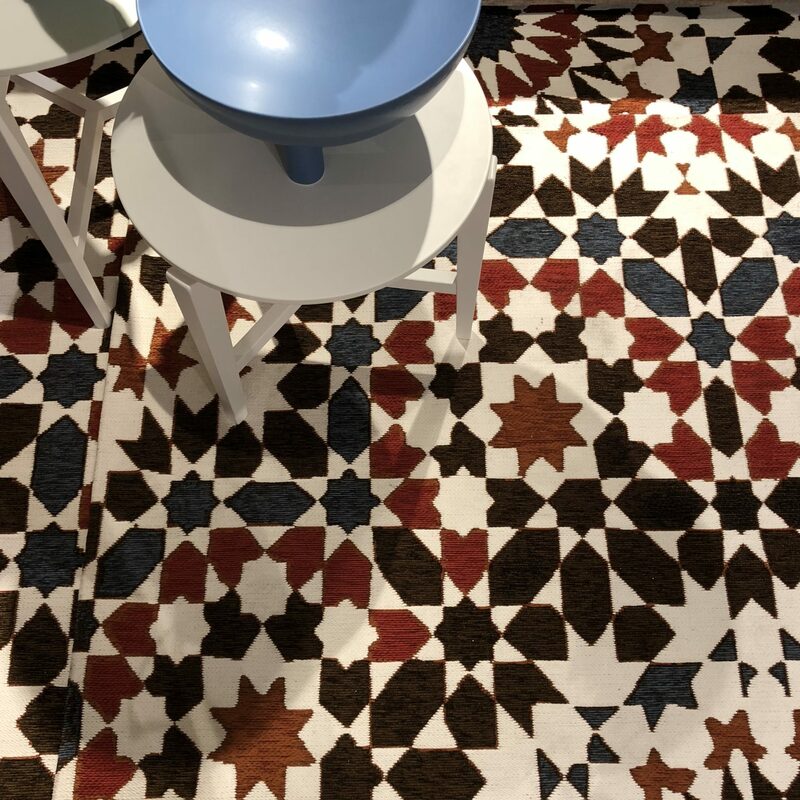 Also, the exotic flavour of many of its new rugs, as previewed at the Milan International Furniture Fair earlier in the year. Then I wanted to focus the look around a series of strong sculptural ‘Future Classic’ pieces, setting them against a sophisticated palette of colour, pattern and texture. 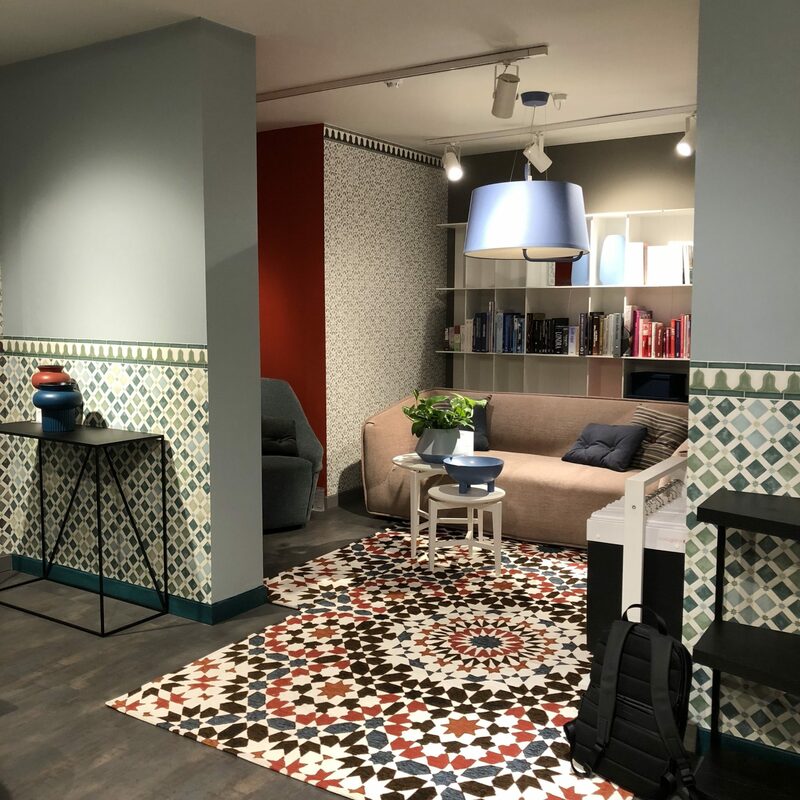 As such, I divided the upper floor of the showroom into a series of five sets — the windows, the entrance sequence, the back and the nook — each guided by colour such that it leads you from the front to the back of the store as a coherent journey through the range for the consumer. 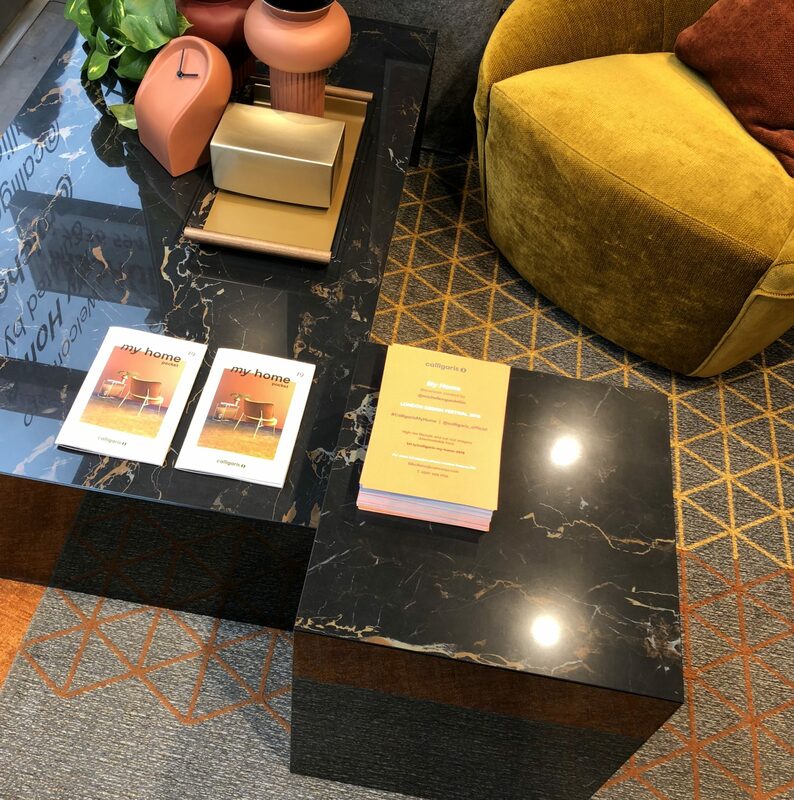 In the windows I focused on on a palette of deep mustard yellows, terracotta and the rich amber veined marble pieces used in the collection. The effect here is of an introduction to the whole. A pair of welcoming sets that cross reference each other to make an inviting proscenium of sorts through which to view the action inside. Windows play such an important role for any shop. It’s all about kerb appeal: giving just enough of an indication of a brand to entice a browsing passerby inside, while also telling a complete story in their own right. 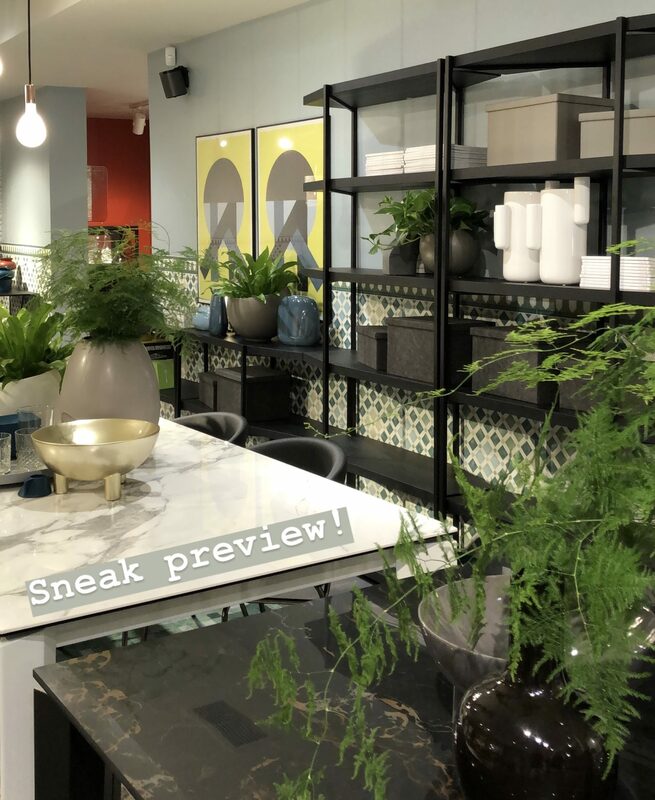 Then, as you enter the space, there is a wide glass-screened staircase on the left that leads down to the lower floor of the showroom, alongside it a huge blank wall which was painted grey. I decided to leave this as it was and work to complement and contrast on the opposing side instead. 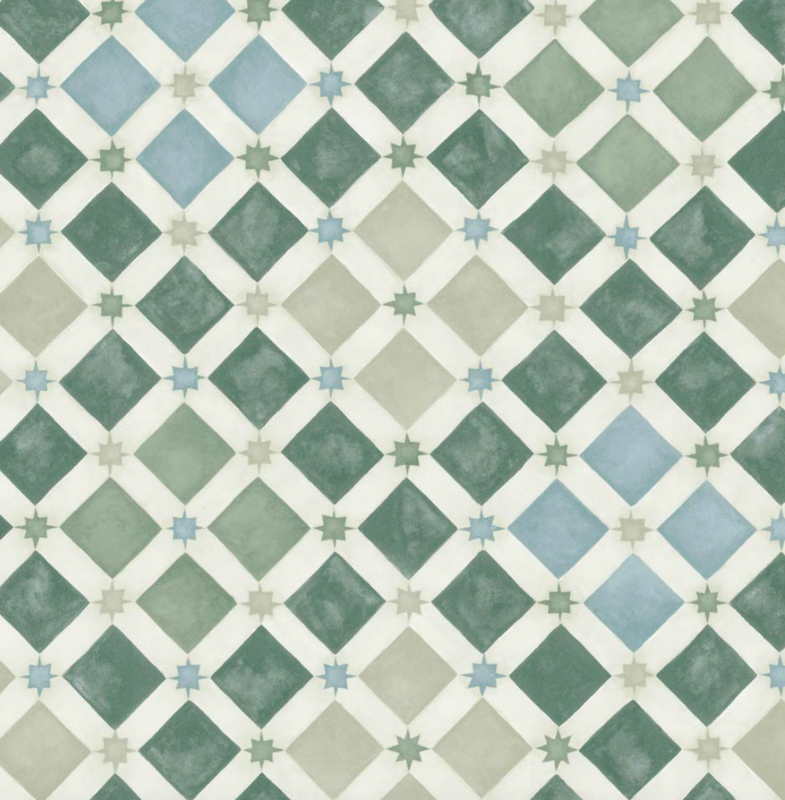 As such, inspired by many of the new Calligaris rugs, I specified two papers plus coordinating borders from the Martyn Lawrence Bullard collection for Cole & Son, in grey and green. It’s an amazing set of exotic yet contemporary papers inspired by “the diverse skills and unique craftsmanship of Eastern and Western cultures”, so it seemed a perfect fit for the current Calligaris collection. 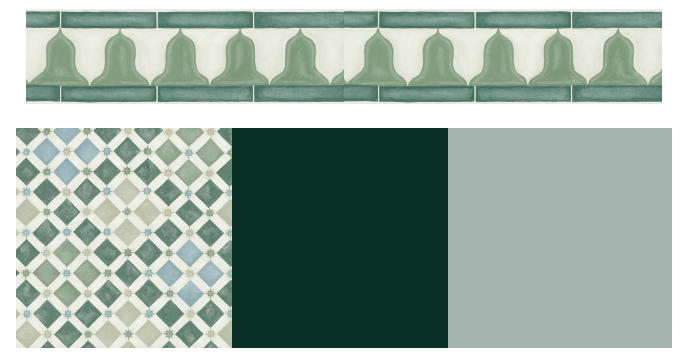 As you progress through the store, the idea is that the next colour mood is green, on the walls and underfoot. Then, at the head of the stairs, I cross-referenced the green in the furnishings, balanced now by more neutral tones in the rugs. The back wall was designed to be a semi-symmetrical grand coda at the end of the space, drawing the eye down the full length of the showroom. 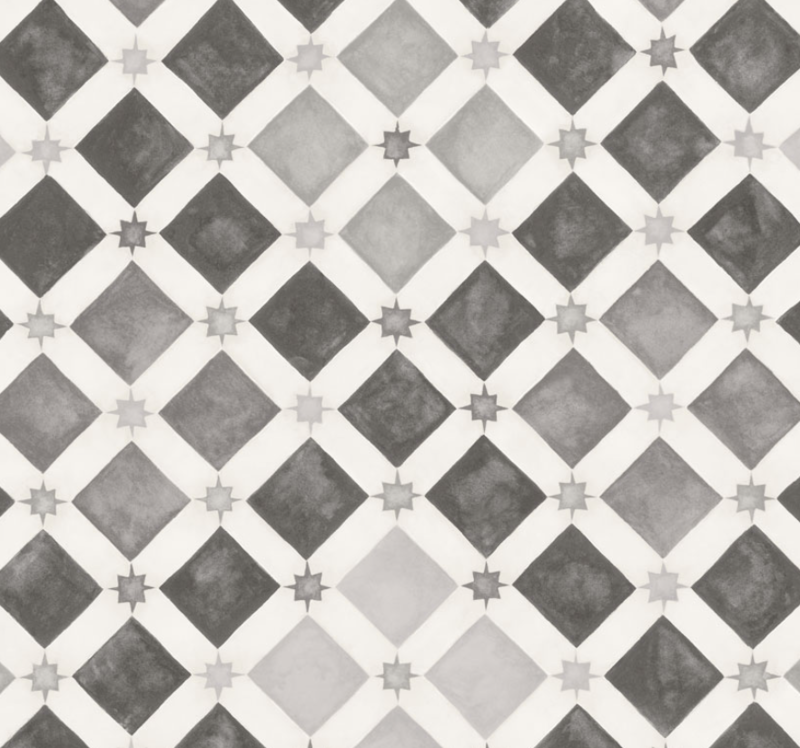 Here, I used the more muted grey colourway of the tile-wallpaper, in tandem with the ‘Jali Trellis’ stone effect paper. 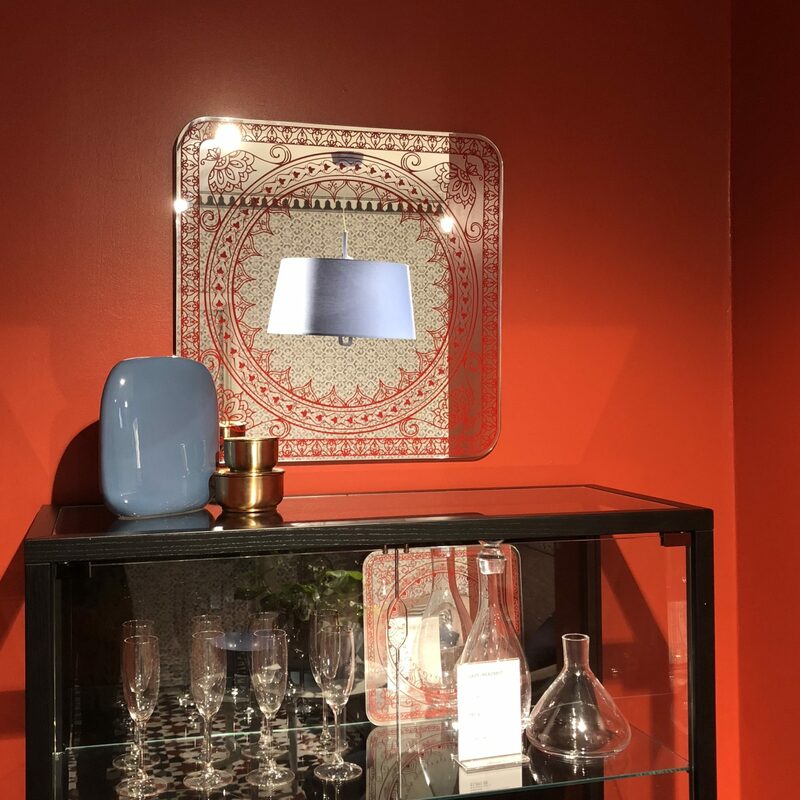 Small wall returns were painted in a contrasting terracotta red to pick up the tones in associated accessories. Finally, a small side room saw the two previous languages combine to draw the consumer to explore a previously rather forgotten corner. 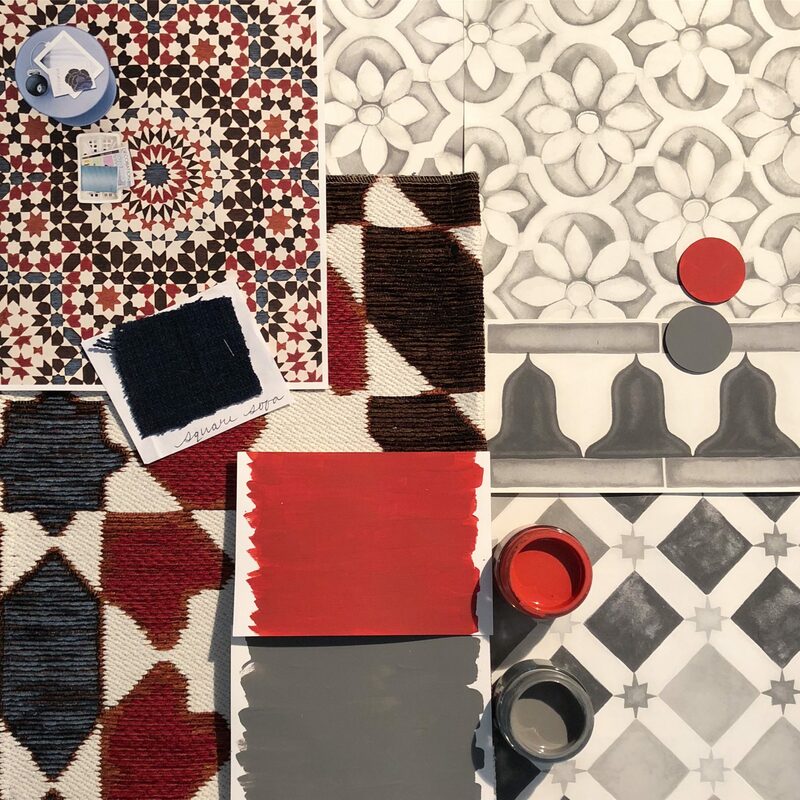 An early moodboard showing the various wallpapers chosen alongside the ‘Marroco’ rug, and paint samples. 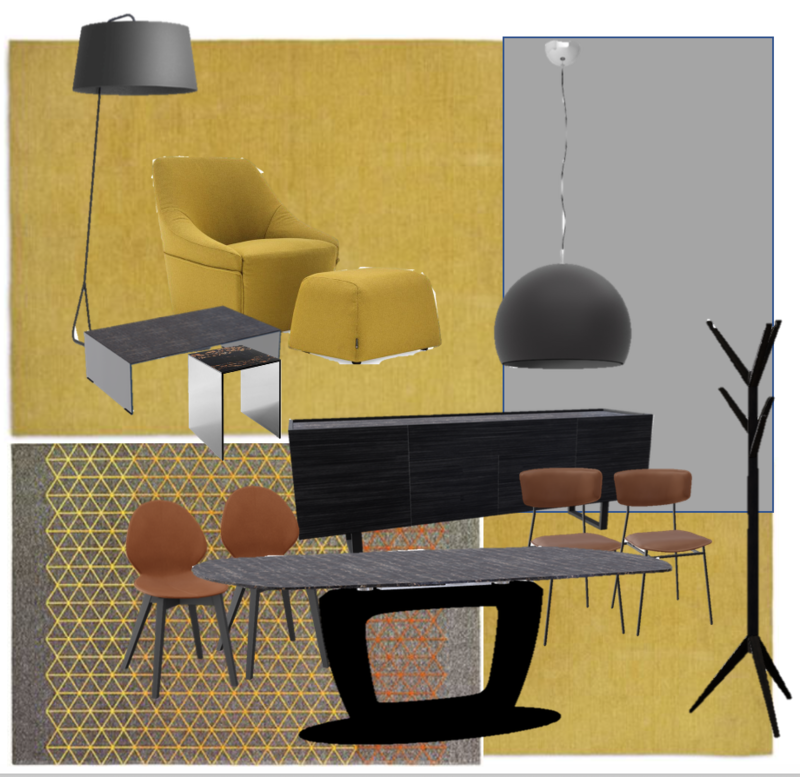 Products specified: Alma armchair in Noor yellow; Medley rugs in yellow; Apotema rugs; Sextans black floor lamp; Bridge coffee tables in smoked glass with black marble tops; Horizon sideboard with black base and black marble top; Orbital table with black base and black marble top; Fifties chairs with black frame and Tobacco seats; Basil W chairs with black frame and Cognac leather seats. 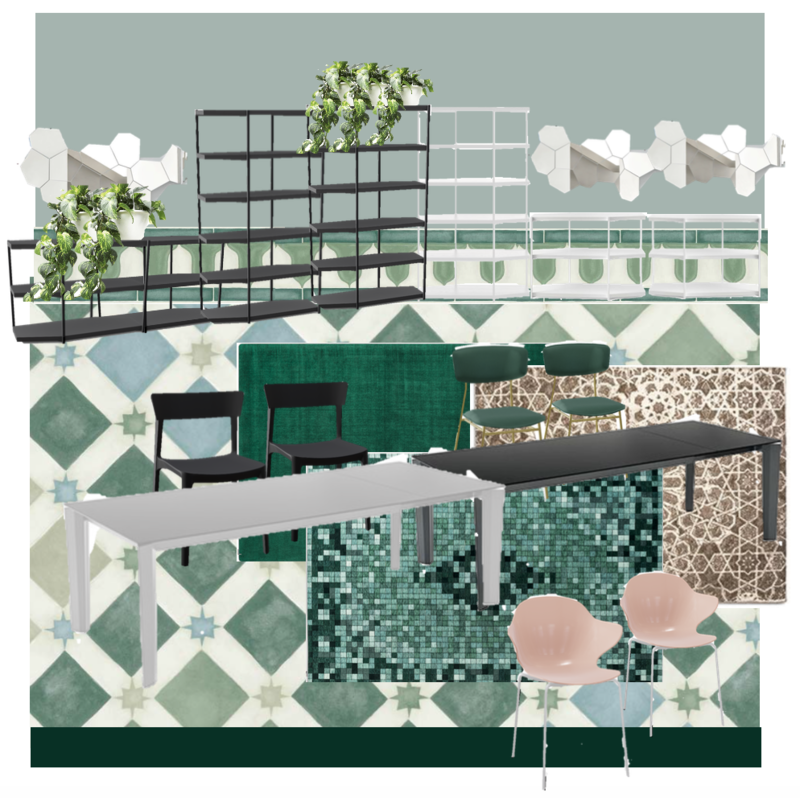 The Calligaris x Michelle Ogundehin curation and styling of its new London showroom. Instagram post! 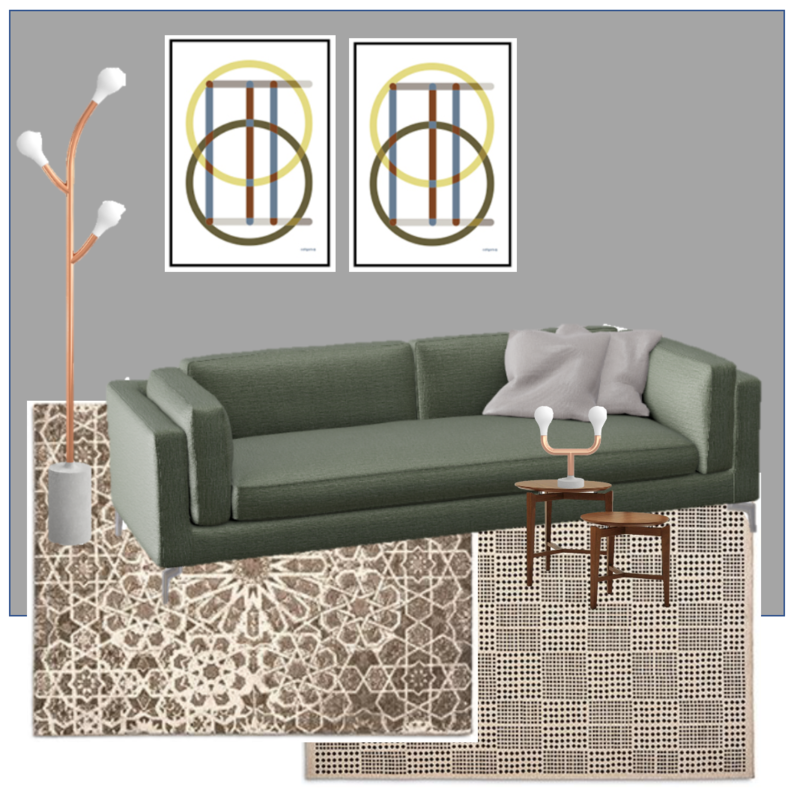 Products Specified: Danny sofa in Cullinan green; Africa rug; Arabia rug; Symbol coffee tables in wood; Pom Pom floor and table lamp + other small accessories in copper and grey. 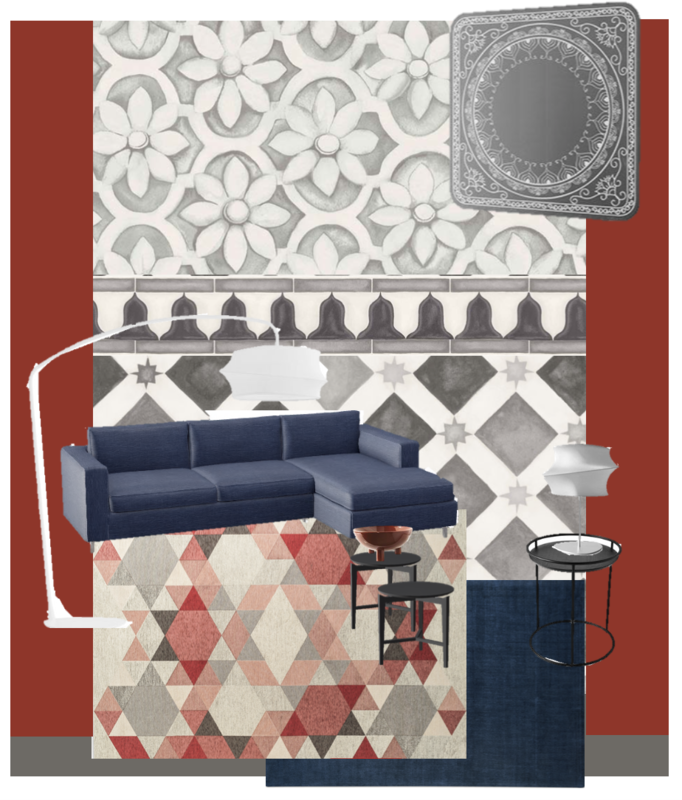 Details of the Calligaris back wall set. 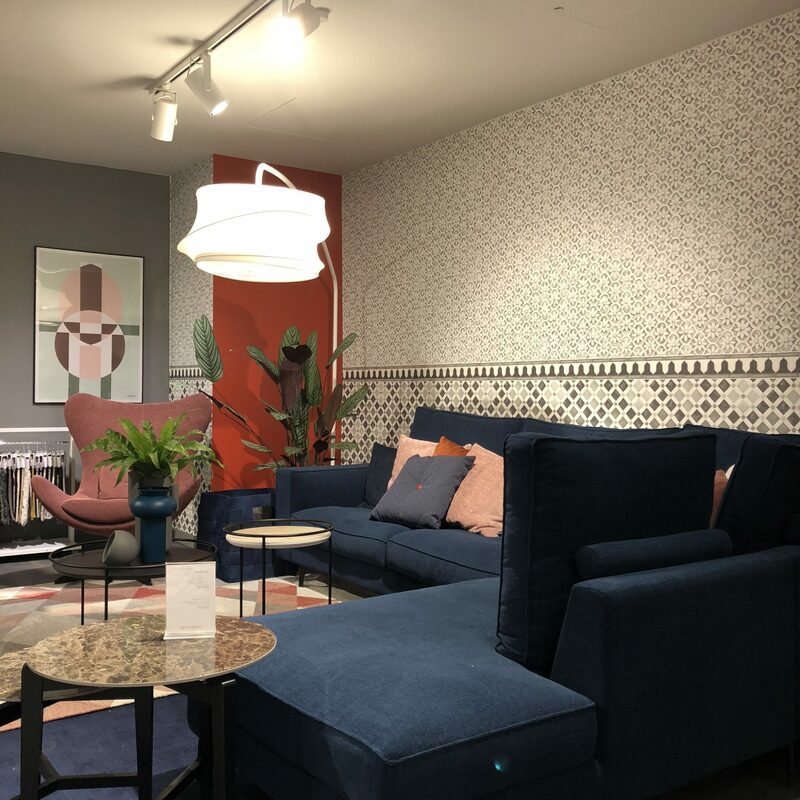 Products specified: Square sofa in Kenton blue; Atollo side table in black; Symbol side tables in black with Emperador marble tops; Esagono rug in pink; Medley rug in blue; Damasco mirror in grey; Cygnus floor lamp in white plus Cygnus table lamp in white. Detail of the ‘Marocco’ rug as seen in the ‘Cosy Corner’!